It is never too early to think about your career promotion. Sometimes you think a promotion is merely about meeting your performance target set for you. In many ways this is true but there are other intangible things you can do in order to make that promotion. These habits if sustained and practiced consistently not only works for you at a junior level, it will work for you even when you move higher up the corporate ranks. Career promotion isn’t about when evaluation happens. It is work done and attitude shown through the months and years. If you want to be someone who is promoted consistently, then take note of these tips. Do you strive for excellence or do you strive for a passable grade with your work? Excellent work is usually noticed. Bosses can tell if someone did more than is required for a particular job. A person with such attitude usually gets noticed. When matched with equally good work, a job promotion isn’t hard to come by. Whatever you do, give it your best shot. Whether it is work you volunteered for or work within your usual scope of responsibilities. Do your work with pride, passion and belief. Know that everything you do has your name on it and you will be judged by the work that you do. When you gain a reputation for giving your best everyone wants you to be on their team. Someone like this will be difficult to miss when it comes to career promotion. Cultivate a habit of keeping your promise if you want to get consistent career promotion.An agreement to a deadline and schedule is a promise. Keeping your promise can be as simple as sending that email to someone when you said you would. Especially important is keeping to promises of deadlines and schedules. What you do affects others, keep your end of the bargain and make sure it keeps the work flowing smoothly because you kept to your promise. When you keep your promise you send the signal that you are someone who is reliable. Do not play the blame game, ever. Take personal responsibility for the things that you do. If you made a mistake, own up to it. Colleagues are more forgiving towards people who admit their mistakes and make efforts to change than those who blame others. Taking personal responsibility also means to do the work cut out for you. In a team environment, others rely on you to deliver in order that they deliver. So, do what you have been tasked to do well. Understand the concept of time. Regardless of how young or old you are. Time is irreplaceable. Once gone you cannot make up for it. Take the notion of “I will make up for lost time” out of your head. Lost time is just that. Lost. A project that allows you to shine has a timeline to it. When you do not respect the value of time, your chances to shine slips away. Someone who procrastinates and idles time away will find that career promotion hard to come by. Be a pillar of strength to your colleagues. Offer them confidence when they doubt themselves. Give people that ray of hope when projects hits a snag. In the midst of all the doomsayers, offer encouragement. Show people how there is a solution. Help give convenience to your colleagues by extending that helping hand. When you do your work think how can you make it easier for the next person. This isn’t just with colleagues; even bosses need that encouragement, hope and ease in doing things. How can you get that career promotion if you do not and are not willing to learn new things? Learn to accord with change especially change for the better. You must keep an open mind and soak up as much as you can. New knowledge and skills bring new opportunities. Update yourself with news, knowledge or skills, constantly. Career promotion is about consistent effort across time. Keep these tips in mind each day you go to work, and you are a step closer to achieving the promotion. 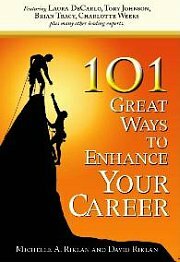 Learn how to advance your career in this article.